This entry was posted on Friday, March 8th, 2013 at 4:01 am and is filed under Uncategorized. You can follow any responses to this entry through the RSS 2.0 feed. You can leave a response, or trackback from your own site. don’t worry, there are many who larve your comic. well, I do anyways. Yes I love the comic too its so awesome! Must be all the fan boys from her fandom. Hi! I haven’t commented before but I’ve been reading our comic for a while now. I think you’re brilliant. Funny comic, good art, nice story lines. This has made it on the list of my favourite comics. if I could classify it (comedic, action, romance, sci fi?) it would probably be my favourite of that genre. 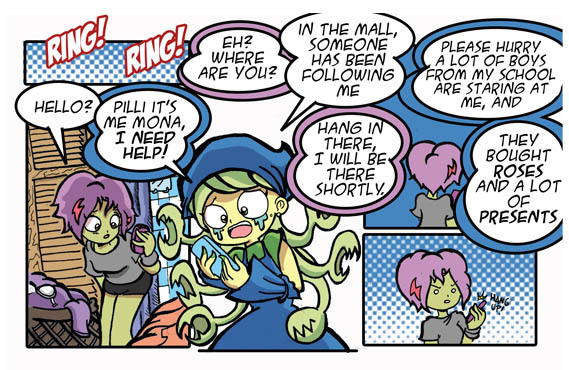 It’s just so typical — the (monster) public makes Mona a celebrity for all the wrong reasons, because of what they *want* her to be, what they are *forcing* her to be, not because of who or what she actually *is*… how very human of them. Unfortunately. Technical question: it’s nice that you have such a wonderful set of avatars (below) for us out here to use, but I have a gravatar account set up, which I use on several other sites. Most of the time, a site will just use it automatically, but your “radio button” selector seems to override that. How do I get your site to use MY avatar? I think you’re confusing you with me. Nobody reads my comic. You are awesomely popular. Anyway thank you everyone for your words, every once in a while I freak out, last night was in a podcast with Jorge Pinto (Bunsen webcomic) and then when I got home saw the dresden kodak kicktarter and I felt so little. I read your comic. I don’t always understand it*, but I do read it. @ ColdFusion: I read your comic too. *Some of the humor can go over my head. It might be a cultural thing. I’d be happy with just more avatars. Where’s that Very Handsome Guy or whoever.. from a few comics back.. I’d use him..